Personally, I've long been enamored with the possibilities offered by Exhibition Mode on webOS, but it wasn't really until the TouchPad was released that Exhibition Mode was fully realized with apps like Flixi and Glimpse. So while the TouchPad was charging forward with passive information display, I couldn't help but look at my lowly Pre. I'd tried multiple apps but kept falling back on the standard clock (on black). And I really wanted to use Agenda, but the combination of the blurry aqua background and lack of customization (particularly calendars) really made it a hard sell. Hard sell no more! Homebrew developer MetaView released into the webOS Nation Homebrew Gallery a new app: AgendaZ. 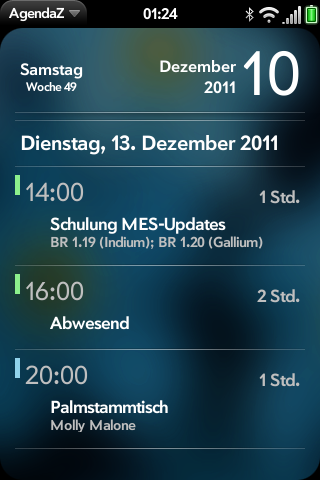 The spiritual successor to the homebrew app simply titled Agenda, AgendaZ makes some simple but much needed modifications to the Agenda view from Exhibition. For one, it's now available as a standalone app with the option to set your background (current choices include the default - titled 'Flowers' - black, or your system wallpaper) and pick the calendars you do/don't want displayed. If you're like me and have a number of subscribed Google calendars you need to be able to reference but don't need at-a-glance, this is a must-have feature. AgendaZ also includes a scrolling multi-day list (up to 14 days), all-day event exclusion settings, and handy at-a-glance color-code bars. It works on both TouchPad and smartphones (though the TouchPad version is a bit rough), and the smartphone version even supports Just Type search within the app. Finally, something to replace the clock on my Pre.